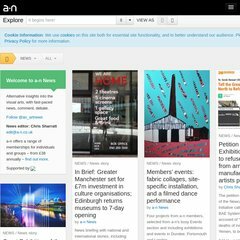 a-n.co.uk A fair share - direct funding for individual artists from UK arts ..
421 users visit the site each day, each viewing 2.30 pages. It is written for PHP/5.2.6-1+lenny8 language. It is hosted by Amazon Web Services Elastic Compute Cloud Ec2 Eu Dublin, using Apache/2 web server. ns1.domaincheck.co.uk, and ns2.domaincheck.co.uk are its DNS Nameservers. The server is faster than 82% of measured websites, at 747 milliseconds.